Top 4 Beauty Benefits of Cypress Essential Oil - beautymunsta - free natural beauty hacks and more! Tired of using the same old essential oils? Mix it up with beauties like cypress! 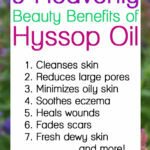 Let’s find out the beauty benefits of cypress essential oil! Cypress essential oil comes from the cypress tree, which is also known as the Mediterranean cypress and Italian cypress. The cypress tree is always green, has tiny flowers, and leaves that are scale-like. Cypress essential oil is always with a spicy and woody scent, which makes it suitable for the males in terms of scent/deodorant. 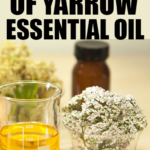 This healing essential oil is said to have initially originated from the Eastern Mediterranean. However, today, it is grown for essential oil production in Croatia, Spain, Algeria, Morocco and Italy. It has a colorless to very pale-yellow color and it is watery in feel. 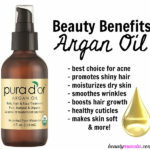 Also, the essential oil possesses some superb properties that make it almost indispensable when beauty is concern. These properties are astringent, antiseptic and more. The chemical composition of cypress essential oil includes terpinolene, sabinene, a-pinene, cedrol, myrcene, bornyl, cadinene and more. 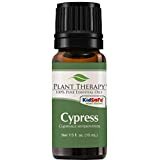 The beauty benefits of cypress essential oil are so amazing that you will most likely add the cypress essential oil to your list of must have after reading the benefits. 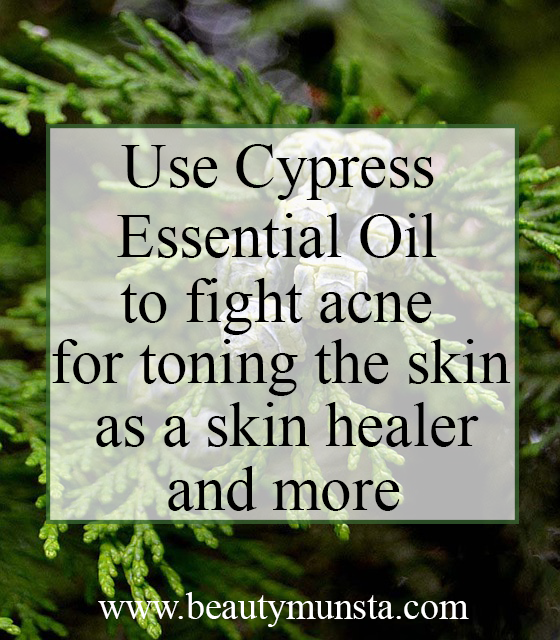 Cypress essential oil can be used along with other essential oils like; vetiver essential oil, tamanu oil, ylang-ylang essential oil, to battle acne, thereby having a better-looking skin. Mix 12 drops of the cypress essential oil with 12 drops of the ylang-ylang essential oil, 6 drops of vetiver essential oil in 2 ounces of tamanu oil. Once mixed, transfer to a suitable container, preferably a dropper bottle. Apply the serum on the acne affected area daily, preferably at night, after washing off your makeup. Nothing can make you feel uncomfortable in public as body odor does. Nonetheless, cypress essential oil is here to save the day! As a matter of fact, one of the best ways to fight off body odor is the use of natural deodorant, and that is what cypress essential oil is. With its spicy, clean and warm fragrance, cypress essential oil serves as a natural deodorant. In addition to being able to combat odor, the anti-bacterial property of the essential oil prevents the growth of bacteria causing the unpleasant odor. Astringents are skin-toning liquids that help cleanse the pores. The main function of astringent is tightening. When you have acne, using an astringent is a must. 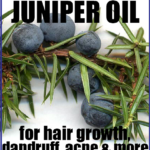 Cypress essential oil has potent astringent properties that you can use to tone your skin and to control acne/pimples. Also, it prevents scarring from acne and keeps your pores healthy. You can try out your own homemade astringent with cypress essential oil, witch hazel and rose water. Add 10 – 12 drops of cypress essential oil to 1 ounce of rose water and 1 ounce of witch hazel. Next, shake vigorously to get everything mixed really well. Finally, apply the mixture to your skin after shaking. 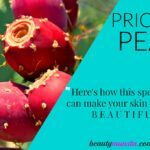 It will keep your face hydrated as well as control your skin’s oily issues. Another of the beauty benefits of cypress essential oil is its ability to heal up wounds quicker. Cypress essential oil possesses anti-septic and anti-bacterial properties, making it soothing for a quicker recovery for wounds. In addition, the essential oil can be used to reduce the appearance of scars because it has the potency to help the skin with the rejuvenation of new cells and tissues, thus making a scar almost invisible or clearing it out completely after an injury or a wound has healed up.